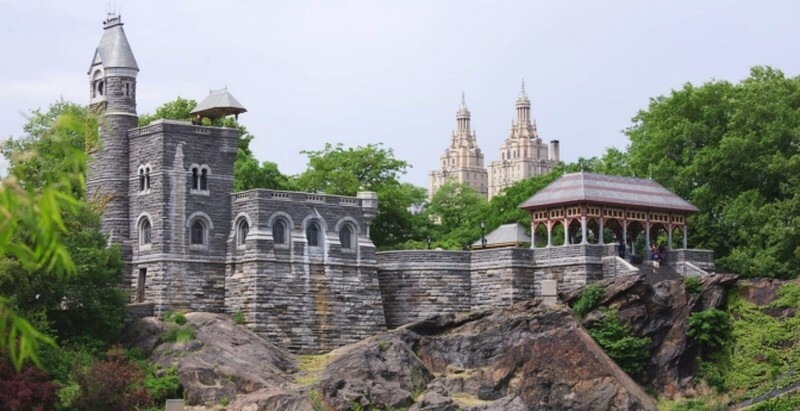 Calvert Vaux, co-designer of Central Park, created the miniature castle in 1869 as one of its many whimsical structures intended as a lookout to the reservoir to the north (now the Great Lawn) and the Ramble to the south. Belvedere provides the best and highest views of the Park and its cityscape. It's fitting, considering its name translates to "beautiful view" in Italian. "Right now, the temperature in Central Park is..." Since 1919, the National Weather Service has taken measurements of New York's weather from the castle's tower with the aid of scientific instruments that measure wind speed and direction. In a fenced-in compound just south of the castle, other data such as the rainfall is recorded and sent to the weather service's forecast office at Brookhaven National Library on Long Island. After decades of deterioration, Central Park Conservancy renovated and reopened the castle in 1983 as a visitor center.